Sure enough, you’ll see Don found some things not too common in other Amish places. 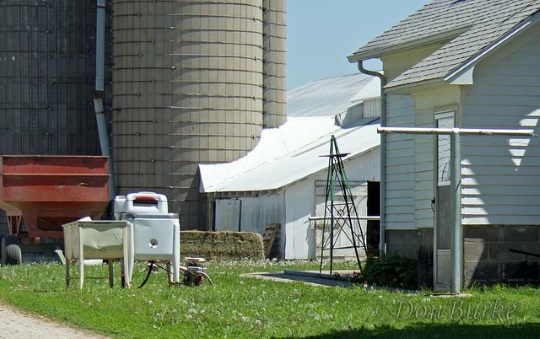 Don’s virtual visit to Garnett gives us a good example of how Amish practices can vary–sometimes quite significantly–in different communities and regions. After a recent business trip had me in northeast Missouri for a few days, I decided to take the long way home and cross over into Kansas and Oklahoma to see a few Amish communities that I had never visited before. 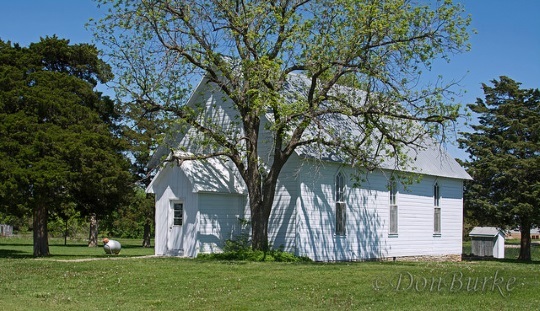 The first settlement on my list was the three-church-district community of Garnett, Kansas (founded 1903). If my many visits to various Amish places have taught me anything it’s that most settlements “do Amish” in at least slightly different ways. In fact, one of the things that I most enjoy is noticing how one place differs from others. Differences in houses, differences in buggies, differences in dress – these and similar things are what I look for and even expect. But when I traveled through Garnett I got a bit more of the differences than I anticipated. …and left out to dry on the clothes lines…. …and there is a typical-looking Amish schoolhouse in one of the districts. 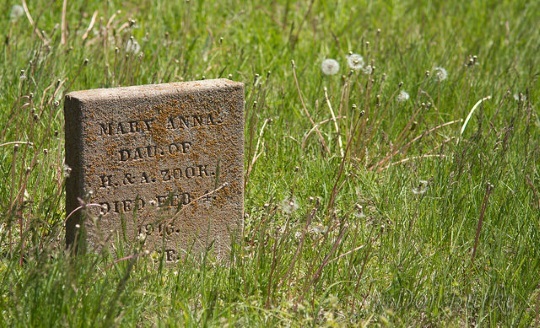 I found an Amish cemetery with typical plain markers. Another caught my eye for a toy horse left in memory of the deceased child. 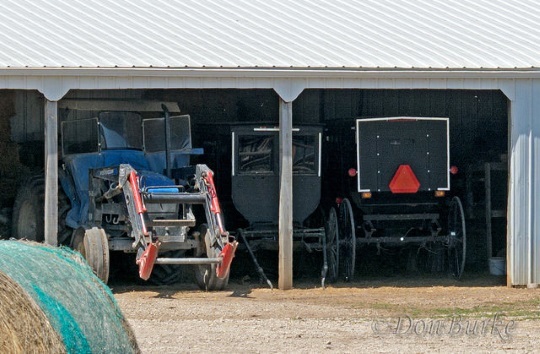 Of course Amish buggies in the barn is nothing surprising…but when Amish buggies share the barn with an Amish tractor, it’s time to take notice. … and you can see them everywhere. As I understand it, the Amish here use their tractors for more than agriculture, routinely driving them to town or other places they need to travel through the week (I believe they use horses and buggies for Sunday trips to church). 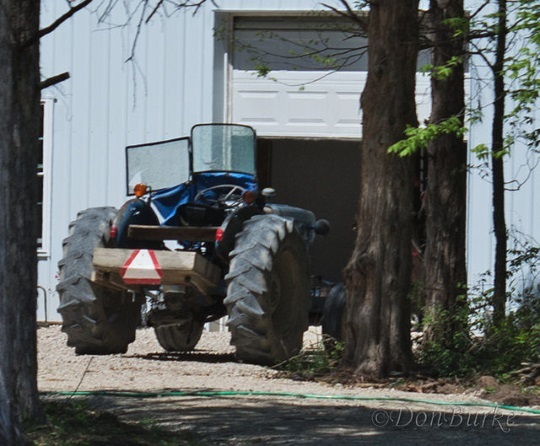 And here is a tractor that seemingly has even been given its own garage space. Notice the ‘box’ mounted to the back of the tractor. I’m guessing that this allows the driver to carry passengers or possessions — much like the English would use a pickup truck. Along with loving their tractors, it appears that Amish here also love accessorizing them. Since my visit was during the cool days of early spring, several tractors were still equipped with a “heat-houser,” used during the cooler months to channel the warmth of the engine back to the driver. And no Garnett tractor is complete without an old pickup truck bed resurrected and repurposed as a trailer. This was a common sight. …and this sprayer, as well as the blue vertical feeder. Garnett is clearly one of the more technology-savy Amish communities. 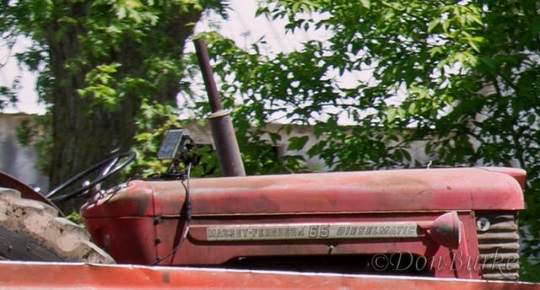 One Amish home sported this 50-60 year old Massey-Ferguson retrofitted with a hay bailer monitor (installed in front of the steering wheel)…. …and another place had solar panels and a modern windmill. Another way that Garnett was a bit different was that it is only the second Amish community I’ve seen that has a Sunday School Building. 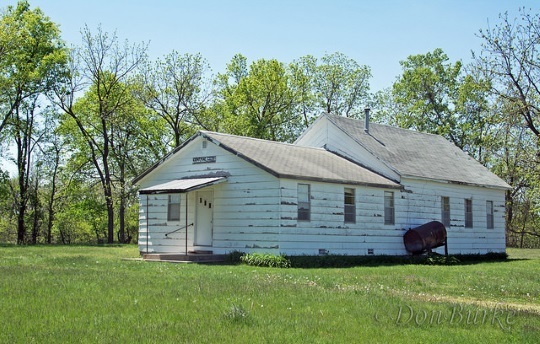 I can’t say for sure about this community, but in Kalona (IA) the Sunday School buildings are used for teaching Bible, German, and church membership classes to the young people. And yet another way Garnett is different is that the map of the Amish in this community includes the public school. According to other information on this website, this is in fact a public (public-funded) school, but most of the students are Amish. Great post. 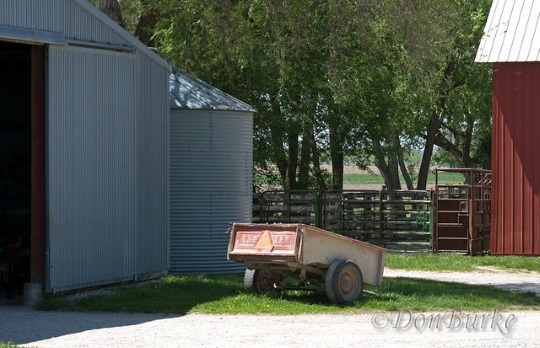 Loved your photos of the tractors and buildings of th a Amish of Garnett Kansas. It’s interesting to see the different ways of the Amish from the different communities or States. Appears that your photographs are an intrusion in people’s privacy, as they all seem taken from a distance – not merely wide angle shots. Think you would appreciate someone doing this to your home? As far as I can tell, the photo essayist did not violate Amish sensitivities about pictures being taken of their faces. As far as the Amish are concerned, I doubt that they would consider his pictures a violation of their privacy. I wouldn’t mind having pictures taken of my home, as long as the photographer uses a rose-colored lens or gives me a two-month forewarning! You do have a point, Greg. A few pictures of our place turned up on line and though I was not exactly offended, it gave us a bit of an uneasy feeling. We knew who had taken some of them and though we had said it was okay, we thought it was strange they did not ask or tell us before they put them up for the world to see. Bill has got a point too. No people were shown, but if the home owners knew their home was going to be put on the internet they might have tidied up and though some might not have minded at all, it’s nice to at least be asked. Greg, I can appreciate your concern. But as I’ve shared at other times, I’ve asked a number of Amish in different places and situations — including an eighty-something year old Amish gentleman at a *huge* Amish auction — about what is acceptable. This older gentleman basically said that as long as I didn’t get all up in a person’s space but keep a respectable distance, I should be fine. I know some don’t want their faces in pictures, but otherwise don’t object. In fact, earlier this spring I was privileged to sit in as a TV crew videoed an Amish family visiting with English guests over supper, and all the Amish asked was that their faces not be shown. And if it matters, all the pictures in this post were taken from the road — most of them from inside my Jeep, in fact — capturing only what is readily see-able by every vehicle that passes by. Of course these people I’ve spoken to don’t speak for all. But it does show that we can not make a blanket conclusion that this kind of thing is offensive to all Amish. And with many being comfortable with what I’ve mentioned above, I’m inclined to think that there would be little objection to a guy snapping off a few pictures while driving by. 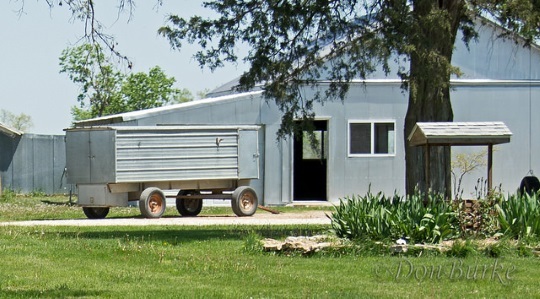 A disclaimer here – I have pictures of Amish buggies, homes, etc. on websites with nary a thought of asking permission. On the other hand, finding my house on Google Earth was a shock, while finding my childhood home in the same place brought back warm memories. I have to agree with Mark in that I’m inconsistent. I want MY privacy, but curiosity leads me to support the cultural lack of it! Well said, Jim. 🙂 We want our privacy but still enjoy seeing the pictures. Is that human nature or what? I’m not Amish, but I would not like people posting pictures of my home on-line. I can see that public places or general scenery are not this issue and realize opinions will vary, but still, taking a photo of someone’s home who may or may not appreciate having it end up on-line does come across as invading privacy. Everything changed with the event of the internet, I realize, and our perception of privacy seems to have changed with it. Some people are happy to share pictures or personal details; some prefer not to. I remember showing a picture of an Amish friend’s home to him. I thought it was cool that a picture of him and his family working in the field in front of their home made it into a magazine. He wasn’t impressed. He didn’t say much — just sighed and shook his head, handed the magazine back to me without a word and changed the subject. That’s when I started really thinking of how the Amish might feel about being shown in public forums simply because of their Amish-ness. Then there are Amish people who might be amused by it or even find it kind of cool, so there is going to be different opinions, just like us English people. Is that phone shanty still in use? It looks like there are flowers planted right up to the door. Great observation, Katie — that little detail had escaped my attention. I looked back through all the pictures I took around that place, and I just can’t say for sure if the shanty is in use or not. It is in front of one of a few houses that were badly neglected (suggesting that the house could have been abandoned). But there was a newer home on the same place and there clearly were people living there. But none of that specifically states whether the shanty was in use or not. One little side-note: While just now scrutinizing through my pictures of the place (most of which I’ve not actually worked up), I found what appears to be a home-made single-wire antenna slipped out of one of the windows of the newer house. Makes me wonder if someone has a cell phone or maybe a radio that they are trying to get better reception on. If it was a cellphone, then that might explain the disuse of the shanty. I have a hunch that antenna is NOT for a cell phone. Many Amish use a 7-Day weather forecaster. I find it an interesting deviation from shunning of the internet (by most). Somehow having a weather forecaster is okay, but having internet access (except for business use) by even the most liberal Amish is not okay. I have Amish first cousins in Garnett. I might be wrong about that antenna, but I know those weather forecasters are hugely popular in Northern Indiana and there are many close family ties between those two communities. 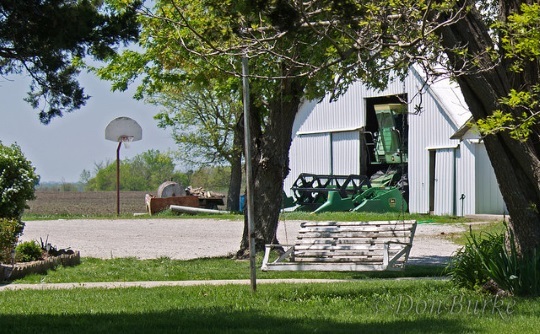 I could be wrong, but a few of the old schoolhouses are still in use, but as 4-H buildings, not as the article descibed. Thank you Don for sharing your pictures and experience. As for privacy of picture taking. 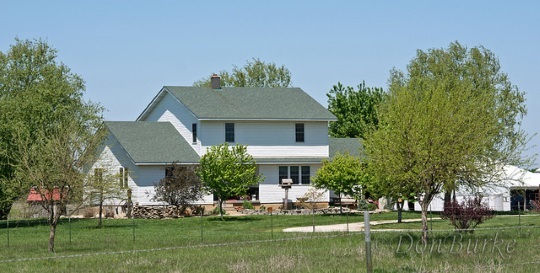 I have taken pictures of houses, farms, beaches, etc. and posted them on facebook many times. Tourist have probably taken pictures of my house for all I know. I live in a tourist area where people are always taking pictures. What a shame people are so touchy. Not all of us can afford to travel to these places so enjoy others who freely share their travels through pictures. The Amish of Garnett, Kansas have the most wonderful Amish people! We just adore each and everyone of them we have been blessed to know! They are an enormous part of this community! We get A1 help from them. Hard working people dedicated to service! Fresh produce we get to eat thanks to the Amish! Perfect work on appliances and reasonably priced. Wood flooring laid excellent. U need help they will always lend a hand or give U advice! Here in Garnett, Ks. AMISH are loved, respected and necessary. Baptist(Brethren)–Old Conference Annual Meeting. Friends from the Washington-Franklin Mennonite Conf. invited me to stay at their place, near Hagerstown MD. 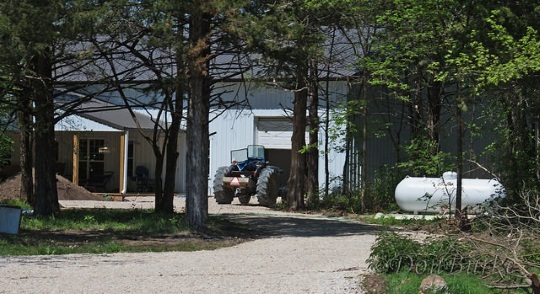 Why do some Amish farm with tractors? Elizabeth sorry I missed replying to your question last week. I had a busy one 🙂 Below in another comment, I mentioned the heat being hard on horses beign a reason that tractors are used in places like Oklahoma and Kansas. In addition to that, I have seen the hard-packed soil given as another reason for the tractor being used in Oklahoma communities. 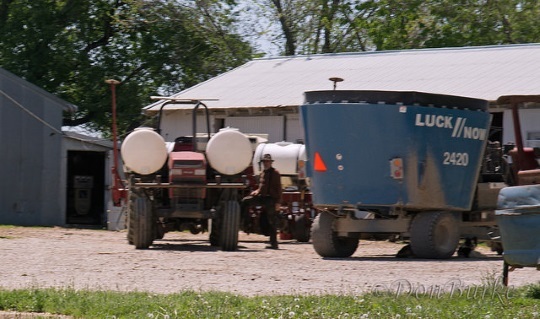 The Chouteau community uses them, and the Clarita Amish adopted steel-wheeled tractors in 1994 with the difficult to work soil being the reason given. I don’t know how Amish farm sizes compare there but it’s an interesting possibility. Those very well may be true justifications for using the tractor. But also, if a group wants a new technology, it can be useful to also attach a practical or economic justification for adopting it. I’m not saying that’s necessarily the case here, but something to keep in mind. All things are lawful unto me, but all things are not expedient: all things are lawful for me, but I will not be brought under the power of any.” My concern as noted in prior posts is that some Amish are being brought under the power of these modern inventions, when it is not necessary for their existence to use tractors, only for their pleasure and ease of life–the same reason the whole world lusts after new and better things. I intentionally crucify myself, practice self-denial in my life, pick up my cross, and follow my Lord and Savior by keeping His commandments out of love to Him! Can all readers say the same? If anyone wishes to criticize me, may it be done out of love for my soul, to make me a better person, and not out of revenge, since that will not be good for YOUR soul!! No, you’re being assumptive, Leon, and you’re also incorrect. I don’t have anything to do with rationalizing why such and such a group does this or that. My purpose on this site is not to argue one group’s way of doing things is right or “better” or “more Amish” or justifiable. That’s up to the individual group and person to work out for themselves. There is a difference which I hope you see. But I don’t know if you do, or want to, because based on your comment history I get the impression that more often than not you come here simply looking for a reason to criticize or disagree with other commenters. This is your June 11th comment below Amy’s: “As far as adopting tractors, MY UNDERSTANDING IS that the HEAT is such in places like Oklahoma and Kansas that it’s HARD TO FARM with horses and thus the tractor has been accepted in these places.” (CAPS made for effect). Even if your “understanding” comes from hearing some Amish person say the above, are you not advocating that point by repeating it here so the reader makes an “assumption” that heat is a valid reason? Yet, Erik, you accuse me of being “assumptive” above? The only “assumption” I make, is the FACT that the Amish way of life includes the use of the horse and buggy for local transportation, and the horse or other large animal for field work. When I read of so-called Amish using tractors to drive to town and for field work, there is no assumption made, Erik, it is a fact–they are the ones who have deviated from the Amish norm. This is because the first Amish did not have tractors, only the more recent and modern groups which still like to think of themselves as Amish are incorporating tractors and other modern technology into their lives. So when you give your “understanding” as above, and I give mine as here, you find it hard to accept mine for some reason, even though I am looking at the “true” Amish as the original lifestyle starting with Jacob Ammann, or as close thereto as possible. 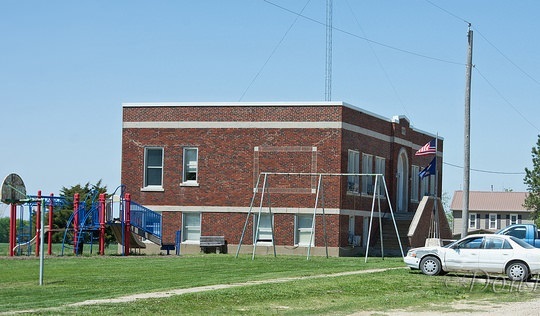 Garnett, Ks. does not seem to be historic Amish in lifestyle, do they? I wish I had time to reread this & think it through, but I’m rushed right now. I had to think of how at one time buggies were forbidden, then discouraged, then accepted, then required in Amish churches. Other things that were considered “risky” in the past include things the Amish now use without any hesitation, like threshing machines, sewing machines, washing machines, grain binders, bonnets, suspenders, and shawls — all of those were things that were controversial if not outright forbidden. That line or whatever has constantly been changing and adapting. I am guessing the Amish in KS would not been too concerned about whether a non-Amish person considers them to be Amish or not; what is important is what is right for them and what they have agreed upon. When and who forbid the use of buggies–please quote something in writting? And which Amish today “require” the use of buggies–could not a person be Amish, born and raised, and walk to church, or ride a horse as a single unmarried person, and still be an Amish member, without owning their own personal buggy? So please tell us which group “requires” a person to own and use a buggy before they can become a member–there may be such, but I haven’t heard of any Ordung or rules like that–can you imagine an unmarried woman (maybe a school teacher?) being “required” to own a buggy just so she could join church?? Please, let’s be careful what we write. Likewise, your other allegations of what were “risky” things, may be irrelevant, since at some point in time they may not even have been invented, so of course there would be a time when the Amish also didn’t have them. And even if they didn’t have a threshing machine, how many Amish groups allow the use of hiring a neighbor English person to harvest their crops with a thresher or combine machine? My point was, let’s recognize that Jacob Ammann (and others such as Dietrich Phillip) of his time set standards which even today are guidelines for us to discern who is Amish and who best fits in some other denomination. The Garnett group obviously has many of “New Order” traits or even conservative Mennonite life style traits which bring into question if they can fellowship with “Amish” or be considered representative of Amish people. And I hope you prayerfully consider my post of yesterday about “only God gives understanding”. I am sorry I was not clear in how I wrote my last comment. I apologize for the confusion. By “requiring” the buggy I meant that if a person is going to own their own form of transportation vehicle, the buggy is the preferred or accepted vehicle. Though there are single women and girls who do own a horse & buggy, a person could be Amish and not own a buggy. Some do not own buggies and might walk, bike, scooter, etc. to where they want to go. For information on the history of buggies being forbidden then accepted, see Stephen Scott’s book “Plain Buggies” pages 9 & 10. Very informative. (next par., pg. 10) “The general pattern for Old Orders has been to hold off on adopting new things until after the object is very commonplace or no longer thought of as a luxury item. Then a few individuals begin using simple, old-fashioned models of the thing which HAD BEEN UNDER QUESTION and gradually the once FORBIDDEN item becomes acceptable.” end quote from book. So you see, Mark, Mr. Scott does not directly say the Amish forbid use of the buggy, OR THAT HE KNOWS OF ANY AMISH GROUP THAT FORBID IT, but that he THEORIZES that since they accept things slowly, and are not the first to buy a model T Ford when they are invented for example, that they indirectly forbid the use of the buggy by their customs and way they live life–they will not go out and buy the newest IPOD or other device, but let other English be the first to do so, then maybe gradually work such into their lifestyle if possible. This does mean everything that is newly invented is “PROHIBITED” but only that the Amish religious beliefs dictate that they not be leaders in accepting worldly things, whether it was a buggy hundreds of years ago, or the threshing machine, or an electronic device today. Likewise, to prove my point about the Garnett Amish being outside mainstream Amish, you ( and Erik) should have quoted from page 11 of PLAIN BUGGIES, where Mr. Scott writes: “The horse and buggy has become very much an integral part of the Old Order way of life. On this and other matters the plain people have said, “Whoa,” to change.” THIS PROVES MY POINT, that Erik attempted to justify and rationalize the use of tractors for personal transportation by the Garnett community equating them with other Amish, but they do not qualify as Old Order according to Stephen Scott, and probably not even as New Order Amish, but more along Beachy Amish or Mennonite lines. I intend on checking out this book and reading it entirely, and maybe others by Stephen Scott. To that extent, you have been helpful in educating me about the Amish, although I obviously will consider Scott’s books very much his personal opinion unless he has other references cited in the back of the book. Likewise, do you now believe it is your personal opinion, Mark, that the Amish once prohibited the use of the buggy? If not, I still need references!! I left out the word “not”–it should read this way above: “This does NOT mean everything that is newly invented is “PROHIBITED” but only that the Amish religious beliefs dictate that they not be leaders in accepting worldly things, whether it was a buggy hundreds of years ago, or the threshing machine, or an electronic device today. That was the book I had convenient and if it does not pass, I will stand corrected. Both oral tradition and Ordnungs-briefe make mention of how buggies were not allowed as they were considered too luxurious. Though not 100% sure and unable to check it immediately (not having the book at hand) The book “Alte Schreibens” does contain Ordnugs-briefe from the 1800’s and MIGHT shed some additional light on this. Farm-wagons & carts were considered more fitting for simple farm people. Simple top-wagons like the Nebraska Amish still use were the first vehicles with tops adapted by the Amish. Note the difference between terms like wagon, cart, top-wagon, buggy, surrey and carriage. There have been changes since the book was first printed, even considering the 1998 revised edition. That series of books makes very interesting reading and though I don’t own them all, I think I have read them all. They are easy to read and well-researched. I am really confused as to why a person who is not Amish is carrying on about who deserves to be called Amish and who fails to meet the grade. Some of these comments are very confusing. I work with and know a lot of Amish people from different groups. Let them decide what is right for themselves. But then again, because I actually belong to a denomination, I guess I’m a heretic. Oink. Will, Don’t blame you for being confused by a lot of these judgmental comments. Really, what’s the big deal ? Why do outsiders even care who is considered Amish or not. According to the Bible as long as I believe in Jesus and live a God-fearing life and try to follow the Bible to best of my ability and follow God’s will for my life. What does it matter who considers me true Amish or not. I am what I am regardless of other people’s opinions of me. Jesus knows who I am as his child THAT is what is important. And Jesus said “In my Father’s house are many mansions” so, Leon, if no people who are in a denominational church will be there who will fill them up ? Because according to some of your comments before even most people who are non-denominational are not living right according to you. Thanfullly God will be the judge. I totally agree with you. Our faith in Jesus Christ as our Savior and Lord is the only way to Heaven. Our time here on this earth is so very short compared to eternity in Heaven. In regards to all this confusion about who is Amish. All the arguments are about outward appearance. God says in the Old Testament That “Man looks on the outward appearance but God looks at the heart” It doesn’t matter if we are English or Amish we all are sinners saved by grace – getting what we don’t deserve. We all have sins of the heart like, hate, jealousy, bitterness, self-righteousness, Lust of the flesh, lust of the eye and the pride of life. I grew up with about 50 Amish cousins and I loved being with them. But there are Amish individuals who are not followers of Jesus Christ even though they are members of the Amish Church. That goes for us English as well. Many people have gone to church all their lives because Mom and Pop made them go. They think they are going to Heaven because their parents go to church. In the Bible it was the very religious people who did not think they were sinners and needed Salvation like everyone else. Religion is man’s way of finding God. God so loved the world that He gave His only Son. Who is the Way, the Truth and the Life, No man comes to the Father except by Him. Are the streets of gold and all those mansions too “worldly” that will be in Heaven? Okay, Leon. We’ll go one more round with this. No, I’m not advocating anything. “Advocating” is quite a bit different than reporting what was told or heard. If I had inserted the words “the reason given by these people was the heat, but maybe there was another hidden real reason (who really knows), but in any case I don’t personally say they are right or wrong” maybe that would be more clear. Again, you say I am “rationalizing” as if I am taking a side to defend or justify the decision. I am not. I don’t care what they decide to do. I’m not their judge. My saying assumptive here does not refer to tractors vs. buggies and whether it is a fact or assumption that using tractors is the norm or not. It refers to making the leap that I am somehow defending the decision (which would also be assuming that I care how their community has decided to live out their Christian faith, which, frankly is not my business, so no I do not). In other words I don’t have the interest or the authority to pass the decision on who is authentically or truly Amish, or not Amish enough (or for that matter, to decide what reason for change is “valid” or not). I’ll let them worry about that. Keeping in mind of course, that all Amish change over time, even the plainest. And of course that being the plainest in lifestyle doesn’t necessarily mean being the most devout or closest to “the spirit of Ammann,” since as we might hear Amish say, there is more to them than just the material lifestyle we see on the surface. 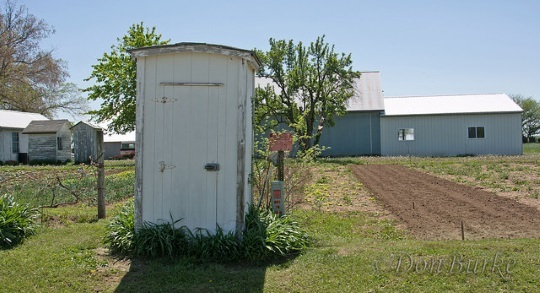 The phone shanties are not really used anymore because most Amish people around Garnett have a cell phone or a phone in the barn – just not in the house. A few people do still drive their horse and buggy to town, but they are becoming more of a rarity. A sprayer? Do the Amish there spray their crops? Yes, Amy, some do. There is a big variety in farming practices & opinions. Now not all sprayers are spreading chemicals, though. A good friend of mine raises organic produce and his sprayer is used for mixes he makes for fertilizer or bug sprays that are made from natural ingredients. But there are others who do use commercial sprays. To be certified organic obviously there cannot be chemicals involved. We do not use any chemical or commercial fertilizers, etc. in our garden or patch, but we do use some on our landscaping and the pasture our horses are on. As Jim Cates mentions here (and as I have mentioned before in this blog), ALL of us (Englisch, Amish, etc.) on this earth are now in public view (online & off, with surveillance cameras all over the place)due to satellites that are continually photographing everything–streets & homes (Google Earth is just ONE such entity), people (banks, schools, libraries, hospitals, stores, etc.). You can’t tell me various governments (not just the U.S.A.) can’t/aren’t getting close-ups of all of our faces, Amish or Englisch. It’s something we have to live with now, like it or not. I doubt VERY much that public outcry could stop it now that the horse is out of the barn/Pandora’s box is open. And, it is a world-wide “invasion of privacy”–no way could we stop other countries from using video/satellite surveillance–not while (as the Amish do) professing to be “peaceful” people who live by a code of non-violence. That said, I thought it was quite interesting about the use of tractors as transportation into town. What’s the maximum speed of a tractor? I know horse & buggy Amish (most) use the horse & buggy to limit the distance they can travel in order to maintain a close-knit community. Are there, I wonder, restrictions on tractor-driving—other than in the fields? I wonder what this community’s Ordnung allows/prohibits pertaining to tractor use? Thank you for sharing your visit & photos, Don! That was an interesting question Alice Mary. From what I see online, it looks like they top out at around 20 or 25 mph. Apparently tractors in Europe are significantly faster. Different communities do use them differently. The ones which require steel wheels are trying to discourage using them on the roads as a vehicle. The steel wheels would still let you haul something on the road a short distance, but it’s not the nicest ride otherwise. In the most progressive places, they have air tires, and may even be like a de facto car, with the buggy mostly used on Sundays. Hmmmm…. I’ve seen some tractors in the Choteau/Pryor Oklahoma community that HAD to have been doing 40 MPH on the blacktop. Now, they were crossing a four land highway at the time, so maybe they don’t usually actually drive them that fast, I don’t know. I always feel saddened when I see a conservative people such as Amish living with more and more modern conveniences. The basic religious tenet of being Amish is to be apart from the world, both spiritually and physically, as much as is possible, to allow them to not be snared by the things of this world. 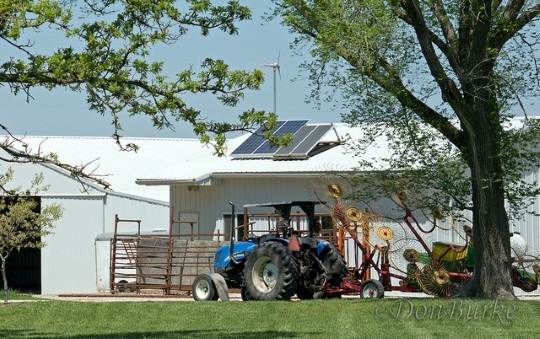 These folks in Kansas are giving in to the same spirit that drives the “worldly” folks to invent and use modern technology, and to that extent the Garnett group are more Mennonite than Amish. How long till they officially change affiliation? 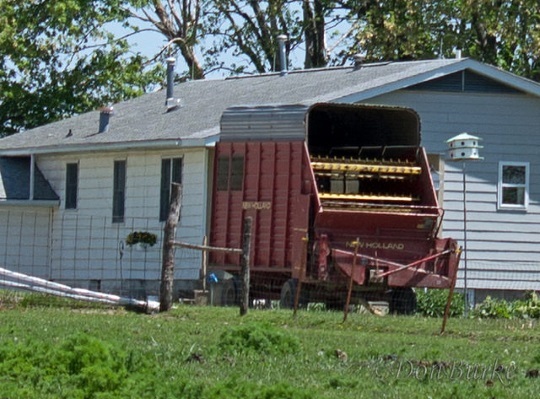 The Covington OH Old Order German Baptist Brethren (not Old German Baptist Brethren), known as “Petitioners”, are a horse-and-buggy church, but they allow the use of mechanized farm machinery. This Brethren group is very small, but seems to be growing rapidly. And, as far as I know, using mechanized farm equipment has not led to a serious trend toward modernization. Their tractor use seems to be very similar to the Garnett Amish, including using the tractor as a taxi to go to town–occasionally with fatal consequences. I don’t think you intend to criticize the Garnett folks, but I am reminded of an American Indian maxim a college prof posted in the entry way to his office: “don’t condemn another brave until you have walked a mile in his moccasins.” I suspect that the Garnett Amish feel they are doing the best they can under the circumstances. Bill Rushby: I have lived with the Amish, walked in their shoes (and barefoot!) ridden in a buggy made by them with a horse they sold to me, and I want you to know that I practice what I preach. I live without a connection to the electrical grid, have not owned or used a motor vehicle for daily transportation for around ten years now, and use a bicycle with a trailer behind to haul my personal items such as food, etc. These Amish at Garnett Ks. could do like wise, I am sure, but choose to live an easier life with the “infernal” combustion engine doing what humans or animals could do! That is what makes me sad, because they are forsaking their Amish heritage. It would be nice if you and the rest of the world also lived without modern conveniences, but at least you are not losing a valuable heritage, since you probably were not born into an Amish family. Leon Moyer: Thank you for your comment. In reply, I ask: is there only one way to be Amish? The question is whether or not they are becoming what they didn’t intend to become. I’ve heard that horses and plows were used to farm because they didn’t compact the soil and engine exhaust didn’t negatively affect the land or crops. With tractors, doesn’t that create a less than ideal farm? As far as driving to town, might as well just buy small motorbikes. They’ll probably use less gas. How else are they really that different? As far as adopting tractors, my understanding is that the heat is such in places like Oklahoma and Kansas that it’s hard to farm with horses and thus the tractor has been accepted in these places. To echo what Rebecca says below, there are many different ways of being Amish. From an Amish girl : YES, there definitely is more than one way to be Amish, same as there is more than one way to be a Christian. I think we are forgetting the Most important question. Have you been to Jesus for the cleansing power ? Are you washed in the blood of the lamb ? At the end of this life we won’t be asked were you Amish, Baptist, Methodist, Apostolic or Mennonite or did you drive a buggy,a car, or a tractor, but did you live for God ? Let’s not forget what is important. Dear Amish girl: There may be more than one way to be Amish, but there is ONLY one way to be Christian–Jesus said, “If you love me, keep my commandments.” Jn. 14: 15. So if Jesus commanded us to not love the world, neither the things in the world, (I Jn. 2:15)then we will deny ourselves these modern inventions which are designed to make life easy and pleasant for the flesh, the human nature. We will condescend to men of low estate, and not be conformed or follow the ways of the world. (Rom. 12:1,2). This is written out of love for your soul, little Amish girl, because no man can serve two masters, so if you are Amish, can you also be Christian??? That is why we have denominations, but the Word of God is clear, we must all say the same thing, (Eph. 4) so if tractors are of this world and not necessary for our existence, then we must all say the same thing –which of course means God will have his hands full on judgment day, won’t He, deciding if some Amish are actually “washed in the blood of Jesus” if they have not been keeping His commandments? May you seek God’s will for YOUR life, and not seek to follow after any mortal man’s religious doctrines. I assume these computers we are writing on fall into the same category as those tractors, for obviously there are many who survive without them. I’m assuming the Amish in that community would feel the tractor is about as necessary as we might see our computers! 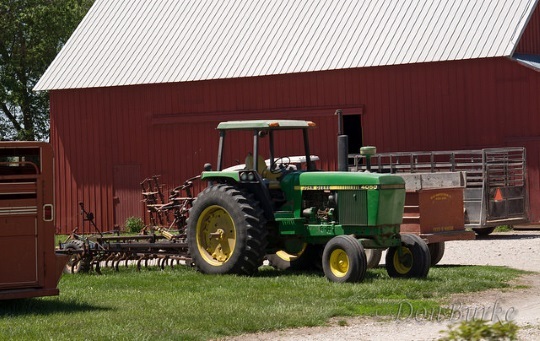 Tractors don’t witness to the Lord by quoting scripture–I use the computer to witness and reprove, rebuke, and give instruction in righteousness as commanded by scripture–not much witnessing of scripture done with tractors is there, or even cell phones as much! I look forward to ceasing electronic communication someday, so that is a sign I don’t “love” these things of the world. Do the Amish long to cease using a tractor? No, or they would simply farm smaller, simpler lives with animals–or even dig a large garden by hand, as I did in Missouri years ago! If you don’t “love” your motor vehicle, what stops you from living with a bicycle, or even moving into a community where you can walk everywhere?? The simpler life is better for us in many ways, including leading us closer to our Creator. So as a New Order who has used a tractor to take our youth group to sing and witness at our closest retirement home and to take youth and goods to places like CAM top help package relief materials to send overseas with Christian Aid Ministry and take meals & singers to the homeless shelter and so on, I’m wasting my time because these acts were done with the aid of a tractor? How discouraging! Hey, “Just Me,” keep up your reaching out and trying to help others! I am a Christian whose denomination happens to be Amish. Knowing that he that is such is subverted, and sinneth, being condemned of himself.” (In all Greek texts, the word “heretick” is translated “sectarian”, I believe, which refers to denominations such as Amish). An heretic. A divider, or schismatic. Any one who preaches doctrines which divide the household of faith is a heretic. So is any schismatic or factious man. ISN’T THIS TRUE OF ANYONE WHO JOINS A RELIGIOUS DENOMINATION OR SECT? This is why I quoted Eph. chapter 4 above, there is only one Lord, only one faith, only one baptism, and if you are Amish, or Menn. or Baptist, or Methodist, or Catholic, etc. then you can not also be Christian, because Jesus did not allow for us to serve man and God! And all denominations are of man. If you refuse to accept this truth, then first Cor.2 may be true: “ But the natural man receiveth not the things of the Spirit of God: for they are foolishness unto him: neither can he know them, because they are spiritually discerned. But he that is spiritual judgeth all things, yet he himself is judged of no man. Amen. written by Leon Moyer. Judge not so ye be not judged. Leon there is a difference between serving God through the church or serving the church. Now if I would be depending on the church rules to save me that would be a problem.At our baptism we are baptized in the name of the Father, Son and the holy Spirit, not the church. The church is just our witness, our helpers, our safeguard, not our salvation. Okay, so Leon there may be only one way to be Christian, but there’s many denominations. That was my point ! And why do you ask if I’m Amish can I also be a Christian ? That is the core of our believes. “He that believeth and is baptized shall be saved” Mark 6:16. I believe and have been baptized upon the name of the Father, Son and the Holy Spirit. As a man believeth in his heart so is he. Furthermore I don’t believe God will be deciding on the judgement day if we are actually washed in the blood of the lamb. That will all have been decided when we made our commitment to Christ. Hope to see you in heaven someday. Until then God bless and wishing you a wonderful Sunday. Very well said, Rebecca. Amen! That scripture reference is supposed to be Mark16:16. I understand that most of us agree on the salvation questions, though there are those that question Christ’s deity (though I believe every group I’m aware of that questions His deity has been defined as a cult). This has been happening for thousands of years, of course, these disagreements, but they all stem from human fallibility and pride. Even here in these forums, we see evidence of this, with people calling each other out. It’s heartbreaking. I suppose when I look back, some of my posts have been not always very loving as I’ve struggled to understand the reasons behind certain ways. I look forward to the day that we can all really be united under Christ. Amy, Very good reminder. Yesterday we had the love chapter and the first preacher talked quite a bit about doing all manner of good works, but if we have not charity/love for our fellowman it is empty. He said if I stand here and preach a powerful sermon, but I don’t do it out of the love for your souls, it’s just like taking a hammer and banging on an empty barrel. We also heard several examples of a “Soft answer turning away wrath”. So I believe many Christians (myself included) would do well To remember what is most important. Love God and love our fellowman even if, and maybe especially if we don’t agree. And “Thou shalt love thy neighbor as thyself”. So, again thanks for the reminder. Looking forward too to the day when we will have no more sorrows, disappointments, troubles, and disagreements. Mr. Moyer has raised the issue of how one distinguishes between “old Order” and other plain fellowships. Since Old Orderism cuts across denominational boundaries, this concept pertains to groups other than the Amish. Several of these other churches do not use horse-drawn transportation, the Old German Baptist Brethren and Old Order River Brethren being cases in point. So…, what makes a denomination “old order”? Good question! That one deserves some research. (not sure of spelling) in Ontario Canada??????? In parts of PA a buggy like that is still called a dach-waegli or zu-en’e dach waegli, but if it is a two-seater with two rear springs it will be called a market-wagon or mark-waage. In the midwest those buggies in the picture are just called a buggy or top-buggy and there is no PA Dutch term for it. In this area, a two or three seat covered buggy will be called a surrey if the seats face forward and you crawl in from the sides. If the two rear-seats face each other and you crawl in from a door on the back, it will be called a mini-surrey. Does that help answer your question? Thanks for your reply to my Buggy name ?? that is spelling that I was looking for. While I am not Amish, I have done a lot of farm work in my life: a little with horses and a whole lot with tractors. I can tell you from the oral and written farm histories of the Texas / Oklahoma region (not so familiar with Kansas) that in areas of those states that have “heavy soil” … black or gray clay based soils farming was never successful and seldom even attempted during the horse farming era of our ancestors. Those people that attempted it quickly determined that it was nearly impossible to turn the soil with animal motive power; the soils were too heavy and too sticky for draft animals to pull a plow through. Other regions such as the upper Mid-West and the Northeastern parts of the country may have black soils too, but they are black because of higher organic matter. They are also generally silt based, loam based or a silty-loam soil. That is an entirely different proposition to plow than the sticky “gumbo” blackland soils found in Texas, Oklahoma and I presume parts of Kansas. Probably one reason that the Amish mentioned in this thread quit farming with horses is that they eventually found that it is just not possible to successfully work their heavy soil with animal power alone. This is especially true for tasks like turn plowing and disking.